At the close of Odd Couple I found myself in possession of an entire loaf of white bread and since I’m a whole wheat, multi-grain kind of girl this left me with a bit of a conundrum. 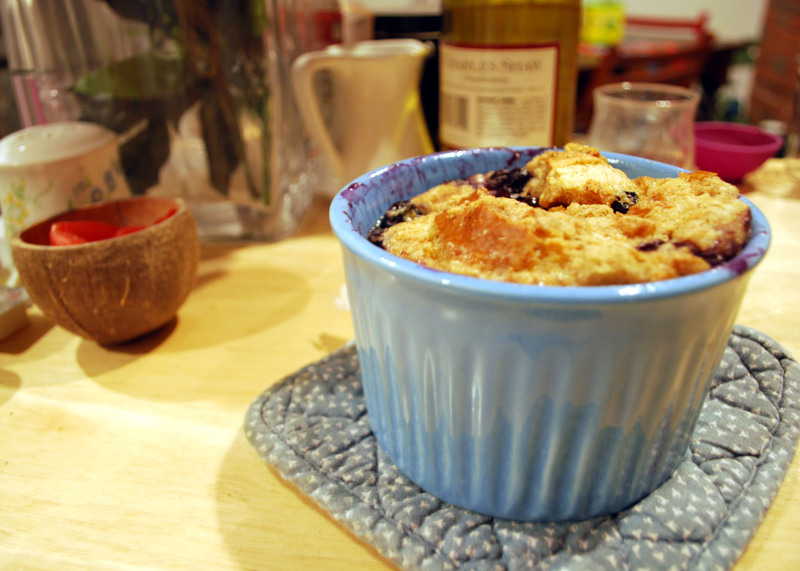 The obvious conclusion quickly revealed itself – bread pudding. Is there really a better use available? 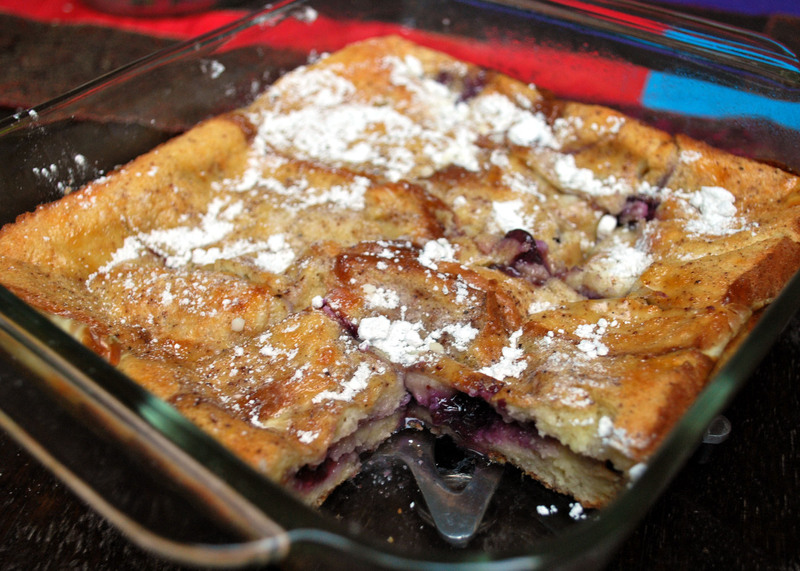 Now, I never really looked at recipe for bread pudding prior to this particular experiment. My first attempt actually came from saving some soggy french toast. Anyway, working off this previous experience and a quick glance at Fannie Farmer’s Cookbook; this is the recipe I concocted. Mix the eggs, rum, milk and spices then tear up the bread into chunks into the mix. 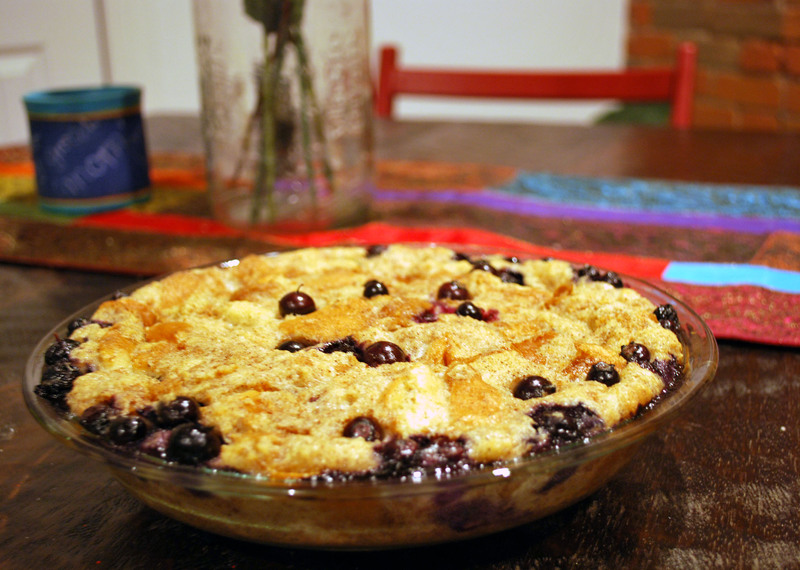 Add sugar, blueberries and chopped up butter. Cook at 400 degrees for 35-40 minutes or until the top is browned. It will rise as it bakes and settle once cool. Obviously this makes a decent amount. I ended up splitting it up between a pie pan and small baking dish. Also, this dish has been co-worker approved. 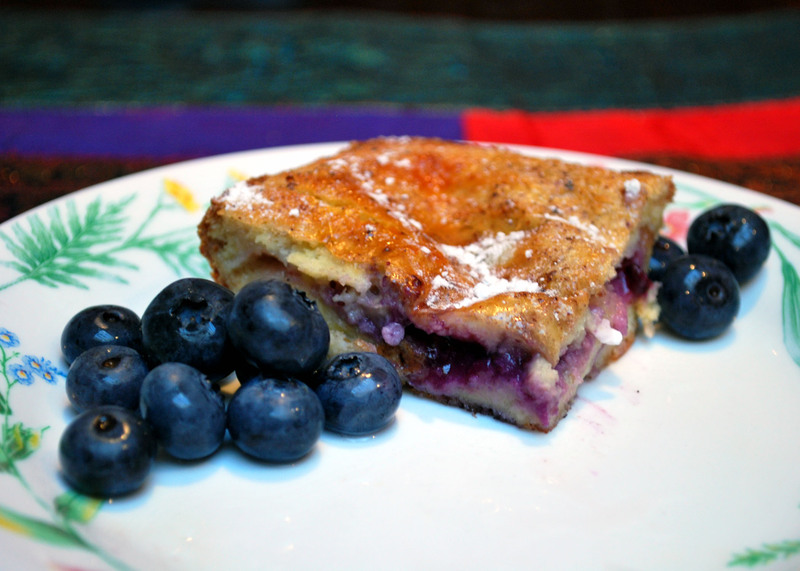 Still having some bread left and a little obsession with lemon curd recently, I decided to try out a healthier variation on the bread pudding that is based more closely upon the french toast recipe that started it all. Grease a 9×9 baking dish. Mix the eggs, milk, spices and butter. Set aside. Spread lemon curd on four pieces of bread and place in the bottom of the dish lemon side up. Some tearing to accommodate may be necessary. Add the blueberries spreading them across in a single layer. Pour 1/2 of your egg mixture over this layer. Spread lemon curd on the other four pieces of bread and place these face down over the first layer. Pour the remaining egg mixture evenly over the bread. I used a slatted spatula to make sure my surface was flat and egg soaked. Let sit for 5-10 minutes then bake at 400 for approx. 45 minutes or until browned. Sprinkle with powdered sugar. Previous Four Days Left… Next Bling Giveaway!